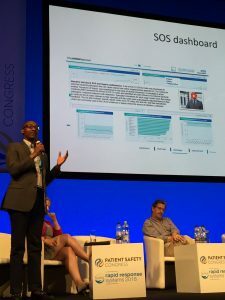 Kenny Ajayi ICHP’s Programme Lead-Patient Safety, shares the developments and breakthroughs his collaborative work is having tackling sepsis…. It was early 2017 and I had been tasked with this pressing challenge as part of my sepsis work with the Patient Safety Collaborative (PSC) at ICHP. Fast-forward just over a year and this challenge has put me on a path beyond all my expectations. The number of people developing sepsis is apparently ‘increasing’. This appears to be due to changes in coding, increase in the number of hospital emergency admissions and an increased awareness of sepsis. Sepsis deaths are actually reducing. Sepsis, simply put, is the reaction to an infection in which the body attacks its own organs and tissues; a severe end of infection or ‘infection with badness’. However, it doesn’t have a gold standard diagnostic test or stable clinical definition. This has resulted in challenges to understand the scale and improve care, as there needs to be an operational definition in order to test and explore the impact of interventions. At ICHP partnership working and collaboration is key. I initially looked to our networks to see what had gone before. A paper authored by Matt Inada-Kim (National Clinical Advisor on Sepsis and Deterioration) with the Oxford Academic Health Science Network (AHSN) was brought to my attention “Defining and measuring suspicion of sepsis: an analysis of routine data”. Their findings found that patients who have suspicion of sepsis (SOS) can be identified in routine administrative data. It is these patients who are potentially at risk of developing sepsis and are the target of intervention programmes to improve the detection and treatment of sepsis. The effectiveness of sepsis programmes can be evaluated by examining the outcomes of patients with SOS – so as a network we had the formula but, at that time, no method to spread it to benefit the population. Our PSC system gives us the unique breadth to bring partners together and spark cross-boundary conversations to explore options. These conversations are critical and vital to move our work forward, which is exactly what we have done with our sepsis collaboration. Working closely with Matt, I took this information to our ICHP Business Intelligence team and, in particular, Andi Orlowski (Head of Business Intelligence) and Julia Wilkins (Head of Analytics) to explore ways they could use this formula to create an intelligence tool which could be used to measure the impact of sepsis interventions. By this time I was also working closely with Kate Cheema (Head of the Patient Safety Measurement Unit at NHS Improvement) who has been an invaluable sounding board and has also shared her extensive expertise. On the journey to developing the dashboard, co funded by NHS Improvement PSMU, I have also had input from local clinicians as well as international figures in sepsis including Mervyn Singer (Professor of Intensive Care Medicine at University College London) and John Welch (President, International Society for Rapid Response Systems), ICHP also hosted a national sepsis workshop with representation from NHS England, NHS Improvement, NHS Resolution and the Care Quality Commission (CQC) with support of the PSC system. Through these collaborations, drawing on Matt, Kate’s, Andi’s and Julia’s incredible skills and know-how, we have now created the innovative SOS Dashboard. The dashboard enables NHS staff – for the first time ever – to use reliable data to monitor and assess the impact of interventions on deteriorating patients with SOS. It focuses on measurement of interventions, which helps local teams determine which methods work best, and which may need to be spread more widely across their organisation. The dashboard also provides a platform to support research studies into physiological parameters and clinical phenotypes associated with bad outcomes in infection. The dashboard is not just an information tool to be viewed in isolation; it enables as wide an audience as possible to engage with and use the findings for patient benefit. It can be accessed by patients, clinicians, managers, data analysts and researchers, and is meaningful for all of these audiences. The dashboard is already starting to show the power and importance of the use of data in the right context. Working as a network through the PSC we are working with clinicians to spread the use of the dashboard, including clinicians from primary, secondary and tertiary care in at least four trusts in North West London and across England . With the aim of launching it fully around World Sepsis Day in September. If you want to learn more, trail the dashboard, or help us share this work. Please contact me. Sepsis is one of the most dangerous medical conditions in the NHS – and it’s only by working collaboratively to better understand our data that we can start to tackle it.